Anthony Gaines prepares to shoot a free throw. The freshman guard has become a major contributor for the Wildcats late in the season. 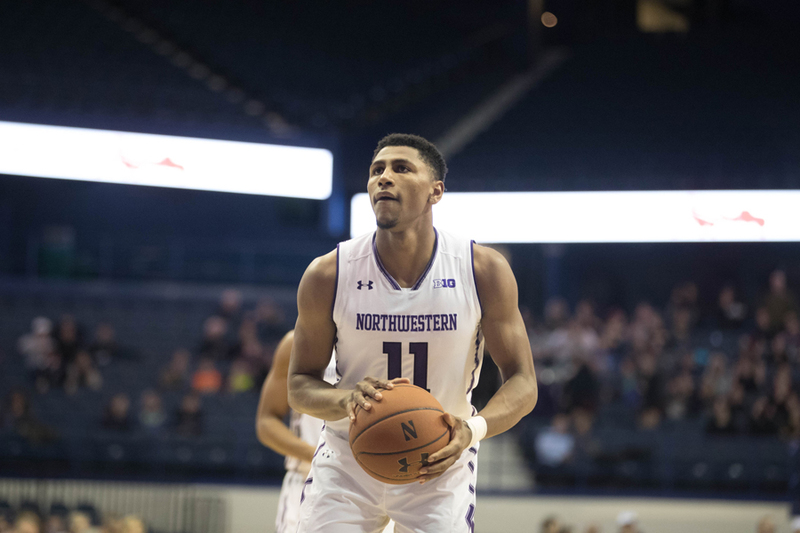 As Northwestern’s regular season-ending collapse has doubled its conference loss in a matter of weeks, freshman guard Anthony Gaines has quietly seen a ton of the court. For that, coach Chris Collins deserves credit. Gaines is undeniably a “big part” of the Wildcats’ (15-16, 6-12 Big Ten) future, as Collins said after last weekend’s loss to Michigan State. And while soon-to-graduate seniors Bryant McIntosh and Gavin Skelly sat for most of Sunday’s 77-70 loss at Iowa, (13-18, 4-14) it was Gaines — one of several players who will be expected to fill their vacated minutes next season — who played a complete 40 minutes. The freshman from New York didn’t put up a gaudy stat line Sunday: He was 4-for-11 from the field for 9 points, two rebounds, three turnovers and an impressive six assists. That’s not atypical for a freshman, though, and especially not a defensively-oriented freshman like Gaines. More noteworthy has been Gaines’ frequent playing time. After playing fewer than 18 minutes in each of NU’s previous five games, Gaines has played 30 or more in each of the last five and recorded his first-ever full game Sunday. In that time, he’s shot 48 percent from the field, shown a newfound passing expertise (tallying 17 assists), recorded his sixth multi-steal game of the season and taken strides towards becoming the well-rounded ‘2’-guard the Cats will need him to be in Scottie Lindsey’s absence next year. Gaines told The Daily earlier in the conference season that he thinks he thinks his role on the team is based on his confidence. Following that logic, Gaines’ increase in confidence has clearly paid off in plentiful playing time, especially while the rest of the team has suffered through an onslaught of injuries. Gaines’ self-described mentor, junior forward Vic Law, has missed the last two games. McIntosh’s usual backup, junior guard Jordan Ash, is out for the year, opening up even more opportunities for Gaines. And Sunday, McIntosh himself could only last for seven minutes, giving Gaines and sophomore Isiah Brown full reign of the ball-handling duties. The coach evidently made up for those preparatory challenges by placing his trust in the team’s youngest contributor — and although it didn’t pay off with a losing-streak-snapping win, Gaines showed yet again positive signs for the future of the program.